US Undersecretary of State for Security Assistance James Buckley tells the Senate Committee on Governmental Affairs that he has received “absolute assurances” from Pakistan that it will not develop or test a nuclear warhead. Buckley will make a similar statement to the House Foreign Affairs Committee in September (see September 1981). [Levy and Scott-Clark, 2007, pp. 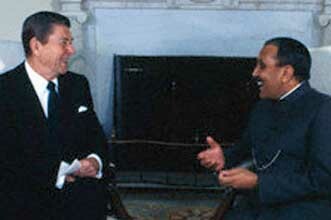 88] However, Pakistan is pressing ahead with its nuclear weapons program (see Shortly After May 1, 1981) and the current Reagan administration has indicated it will turn a blind eye (see April 1981). Senator Jeff Bingaman (D-NM), a member of the Senate Armed Services Committee, asks the Defense Department to re-open its inquiry into the sacking of Richard Barlow, an analyst who worked on assessments of Pakistan’s nuclear program (see August 4, 1989). The request is made because Bingaman has seen evidence that a report by the Pentagon’s inspector general mischaracterized or possibly even fabricated evidence against Barlow. [New Yorker, 3/29/1993] The inspector general will write a report clearing Barlow, but this report will be rewritten to damage him (see Before September 1993).